This review first appeared in the August 6, 2000 edition of the American Reporter. Fr more than three decades, Maddy Prior has been resuscitating and bringing to life traditional folks songs of the British Isles. As the angelic-voiced lead singer of Steeleye Span, she was one of the leaders of the '60s renaissance-rock movement; today, leading her own band, she continues her wonderful habit of finding old gems tucked away in history and bringing them to light again. Prior is among the very best at combining tradition and modernity. Bands such as The Pogues or Sixpence None the Richer that combine alternative and punk sounds with traditional music are only doing what she's been at since the whole counterculture movement began. 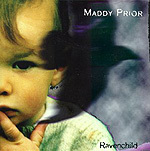 Her latest release, "Ravenchild," finds Prior in fine voice and surrounded with as good a band as she's ever played with. The songs are, typically, mostly stuff you've never heard of and of course wonderfully melodic and lyrically mysterious and great fun all the way around. And six of the 13 songs here are new compositions by Prior  and every one of them as full of the traditions of her native Britain as any of the folks songs that have haunted those islands for hundreds of years.